Dallas based rivals American Airlines and Southwest Airline are unsurprisingly offering different assessments of the current landscape in the market as Southwest enjoys a boost from new long haul flights from its Dallas Love Field headquarters made possible by the lifting of the Wright Amendment, which limited certain long haul operations from the airport. The new routes and capacity additions have created some pressure for American Airlines, whose top base, hub and headquarters is Dallas/Fort Worth. Its forecast passenger unit revenues for 1Q2015 are falling at a greater rate than its legacy competitors, but American promises to compete fiercely with all the LCCs it encounters in the market place in part by matching their fares. American also seems to be pulling other levers to combat some of the added capacity in the Dallas market including rebanking DFW, which should improve the overall performance of the hub in 2015. Southwest became officially unencumbered at its Dallas Love Field headquarters in Oct-2014 with the dissolution of the restrictive Wright Amendment that had taken effect in 1979 at the intervention of its larger competitors, limiting flights from Love Field to serving only the adjoining states of Louisiana, Arkansas, Oklahoma and New Mexico. With its newfound freedom Southwest launched 15 new routes from Love Field in late 2014. The new service included flights to Baltimore Washington International airport, Chicago Midway, Denver, Las Vegas, Los Angeles, Orlando, Washington National, Atlanta, Fort Lauderdale, Nashville, New York LaGuardia, Phoenix, San Diego, Orange County and Tampa. 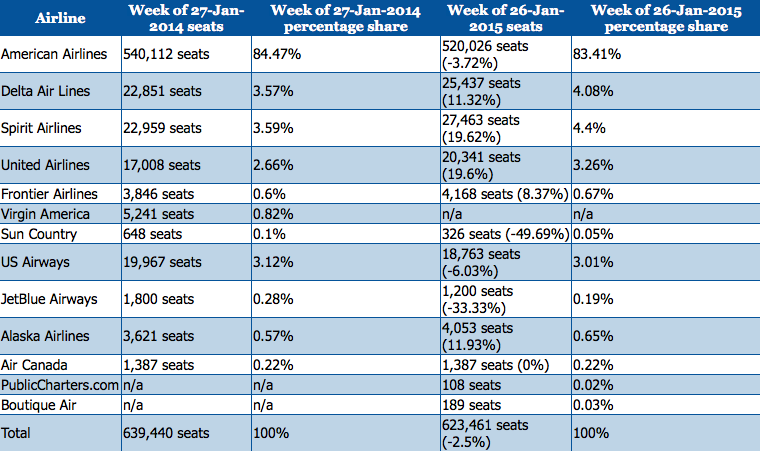 It was a significant push for the airline, reflected in data from CAPA and OAG for the week of 26-Jan-2015 that shows one way seats from Love Field to North America have grown by nearly 40% year-on-year, with Southwest’s seats increasing almost 30%. ULCC Spirit Airlines, whose third largest base is DFW, warned in late 2014 that it had observed dilutive pricing stemming from changes in capacity related to the Wright Amendment expiration, and that it had also seen compression in fares for close in bookings for what appeared to be a willingness by the industry to lower fares in light of lower fuel prices. As a result of the pricing pressure, Spirit slightly refined its operating margin estimates for 1Q2015 from 18.5% to 19.5% to 18% to 19%. 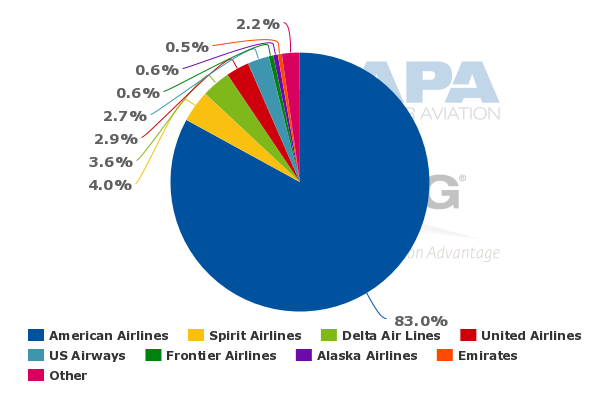 Data from CAPA and OAG for the week of 26-Jan-2015 show that Spirit operates flights from DFW to 12 of the markets Southwest added from Love Field in late 2014. – Baltimore, Chicago O’Hare, Denver, New York LaGuardia, Atlanta, Fort Lauderdale, Orlando, Los Angeles, San Diego, Tampa, Phoenix and Las Vegas. In Jan-2015 Southwest added flights from Love Field to San Francisco and Oakland. Spirit also operates flights from DFW to Oakland. Spirit’s seat share from DFW has increased in five of those markets year-on-year, 57% in Orlando, 23% in Los Angeles, 23% in San Diego, 61% in Tampa and 12% in Las Vegas. Spirit’s seats on routes from DFW to North America has increased nearly 20% year-on-year, but its overall share remains relatively small at 4%. American still has a commanding 83% share on routes to North America and an overall 83% share of the seats on offer from DFW. American’s seat share from DFW to routes in North America has fallen by approximately 3.7% year-on-year and has dropped on many of the routes that Southwest has added from Love Field. American’s seat capacity year-on-year has fallen 13.5% in Los Angeles, 10% in Fort Lauderdale, 5% in Nashville, 14% in LaGuardia, 23% in Phoenix (US Airways is also down 14% in that market) 5% in Orange County, 5% in Tampa, 23% in Baltimore, 7% in Denver, 4% in Washington National and 6% in Atlanta. The airline’s seats on offer from DFW to Chicago O’Hare have grown 11% year-on-year and roughly 10% on flights to San Diego. 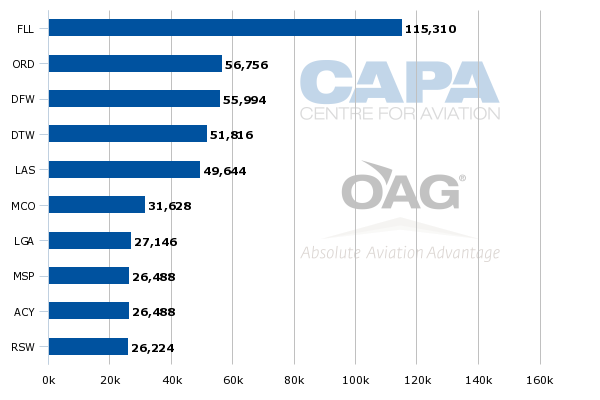 Of course in most of those markets American remains the largest airline by overall seat share; but it appears that American is not attempting to add its own capacity from Dallas in order to compete with Southwest in the new markets. American’s passenger unit revenues fell 1% year-on-year during 4Q2014, which was more than its original forecast of a flat performance to 2% growth. While company CEO Scott Kirby remarked that no one single event drove the decrease, American’s competitors did have large capacity additions in many of its markets during the quarter. “We got new non-stop city pair competition in 50 new markets,” Mr Kirby concluded, with low cost airlines accounting for new competition in 44 of those markets. “While there are always competitive capacity changes, that’s an unusually high and concentrated number of new starts that in hindsight we didn’t accurately forecast,” he concluded. The added pressure for American from competitive capacity increases will continue into 1Q2015 when it estimates that its passenger unit revenues will fall 2% to 4%. Higher completion factors and currency fluctuations are also contributing to the projected decline. It is a sharper decline than the 1% drop-to 1% increase forecast by its major global network airline rival United. Offering a bit more insight, Mr Kirby stated that local yields have declined since prices have fallen in the Dallas market; but local yield volumes have remained stable resulting in consistent load factors in local traffic. He stated that American has been able to improve connecting unit revenue to counteract some of the fall in local unit revenues from Dallas. The rebanking of its Dallas hub should further help to offset some of the pressure in the local market as well as all of American’s routes from Dallas, said Mr Kirby. But he also stressed that American is “matching the fares with our low cost competitors” and competing aggressively. Southwest has previously stated it is enjoying 90% load factors on the new markets from Love Field, some of which is no doubt from pricing promotions undertaken by the airline. But the routes are also a contributing factor to its estimates of flat unit revenue growth for 1Q2015 driven in part by an estimated 3% to 4% increase in average stage length during the quarter. Previously, Southwest has estimated that its stage length from Dallas Love Field will increase 70% year-on-year in 2015. Southwest’s yields notched up 0.7% year-on-year during 4Q2014, and passenger unit revenues grew by 2.6%. Its load factor increased 1.6ppt to 82%. It is a solid showing given that it added 15 new markets from Love Field in Oct-2014 and Nov-2014. But Southwest could feel some pressure from the promotional fares wearing off and the general ramp up from the new routes in 1Q2015, evidenced in its unit revenue projections. The first quarter is also one of the weaker demand periods for US airlines, so both American and Southwest are no doubt looking to stronger unit revenue performances later in 2015. Even as American has largely completed US consolidation and emerged as the country’s largest airline (American and US Airways combined), the pressures it is facing suggest that mergers among the large US global airlines do not necessarily immunise them from competition, even if they do have the scope and scale to meet it effectively. In the short term Dallas should prove interesting during the next few months as it seems that the two largest airlines in the market are engaging in a fare skirmish in some markets. Consumers should emerge as the victors.